Hello there truckers, over this article we are going to discuss on how to go about reporting an increase in the Gross weight of your truck. We on daily basis receive calls from our clients required to file an amended 2290 to correct the mistake occurred on their taxable gross weight of the vehicle. Now refers to this article to get a clear picture on this scenario. Basically the Form 2290 is known to be the Heavy Highway vehicle used tax return which is filed on vehicles which possess a minimum gross weight of 55000 lbs or more and if the same truck is been used over the public highway for commercial purposes. Having said that 55,000 is the minimum weight required to be able to qualify for a Heavy Vehicle however it must not be assumed to the maximum weight of a truck, Heavy trucks tonnage index refers to weights over a 100,000 lbs easy. So, when there is a requirement for a change of the gross weight of the vehicle, all you need is an amended 2290 Form. By filing an amendment you’d only make the difference in the tax due payment in accordance to the increase in the gross weight in lbs. As there is a $22 increase versus an increase of every 1000 lbs. By filing the amended Form 2290, you would receive a new copy of schedule 1 with a digital watermarked indicating e-filed with the date stamp. This entry was posted in 2290 e-file, EIN, Form 2290, Form 2290 Amendment, Truck Tax Online and tagged +2290, 2290 form us irs gov, dot form 2290, Efile form 2290, Form 2290 due date, form 2290 pay taxes location, form 2290 penalty, form 2290 where to mail, fuel excise tax form 2290, highway usage tax form 2290, printable tax return forms 2290 on March 26, 2019 by Truck Dues. Things that you can’t correct once your Form 2290 is Filed! Hello there Truckers, over this article we are going to discuss about the changes that could possibly made over a Filed Form 2290. Almost on a daily basis, we receive calls from our users that they realized that something needs to be updated on their E-Filed Form 2290. 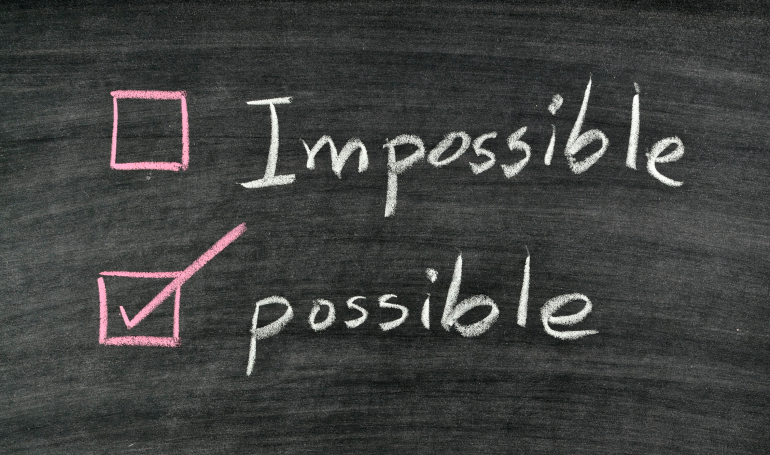 Now we are going to list out what is possible & what’s not! Increase in the Taxable Gross Weight of the Truck. Reporting a change on the Mileage limit of exemption. 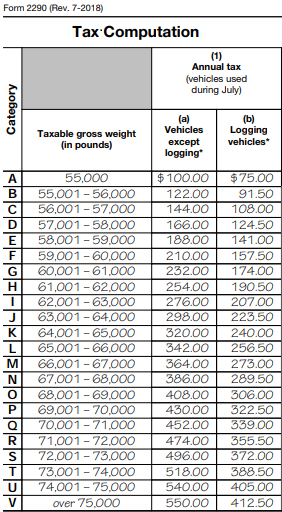 This scenario occurs when the HVUT Filer has reported the vehicle’s gross weight to be minimum for example 55000 lbs, not realizing the fact that the term taxable gross weight always refers to the maximum weight of the truck ( Weight of the Tractor + Trailer+ Load). Now in order for them to be able to report an increase in the gross weight an Amended Form 2290 is filed to make the difference in tax due payment to the IRS as well as to receive another copy of schedule 1 for the corrected weight category. As most of you are aware on the desired mileage limit of exemption set by the Internal Revenue Service, it remains to be 5000 miles for Commercial based units & 7500 miles for Agricultural based vehicles. When the subjected vehicle seems to exceed the desired mileage of exemption the vehicle turns out to be no longer exempt hence the tax due payment needs to be made to the IRS via an Amended 2290. This is one of the most common interpretations involved during e-filing Form 2290. Unavoidable human errors leads to typographical errors on the VIN, which could later be updated via an Amended 2290 Form (VIN correction request). This process also lets the user to avoid an over payment of taxes. Once the Form 2290 is successfully filed and when the IRS issues the digital watermark, the following changes can’t be reported online where the tax payer needs to contact the IRS toll free help line @ (866) 699-4096 to get the changes implemented over the phone. 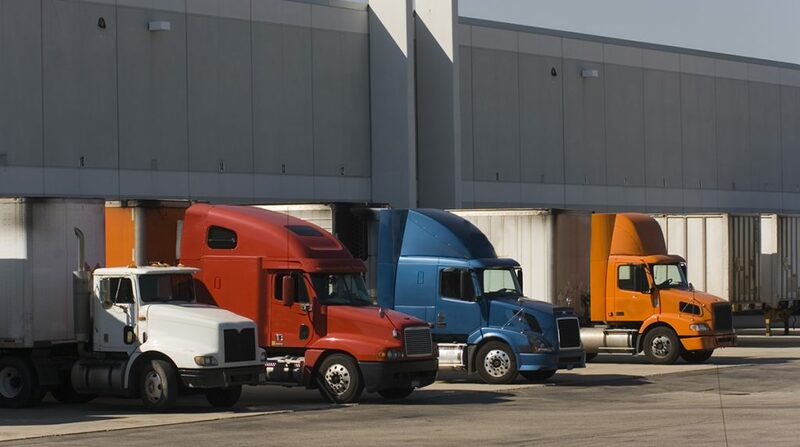 Truckdues.com is rated to be one of the best priced websites among many independent owner operators, we have gained our trust among them due to our committed service where we ensure that are client’s inquiries are addressed on time. E-file is simple and easy, receive the IRS digital watermarked copy of schedule 1 back in your e-mail minutes after you e-file. This entry was posted in 2290 e-file, Agriculture Vehicle, American Trucking, EIN, Employee Identification Number, Form 2290, Truck Tax Online and tagged federal heavy highway form 2290 irs, file form 2290, form 2290 due, form 2290 heavy highway vehicle tax, form 2290 heavy truck tax, form 2290 heavy use tax, form 2290 instructions, form 2290 online, internal revenue form 2290, IRS form 2290, schedule 1 form 2290 on March 19, 2019 by Truck Dues. 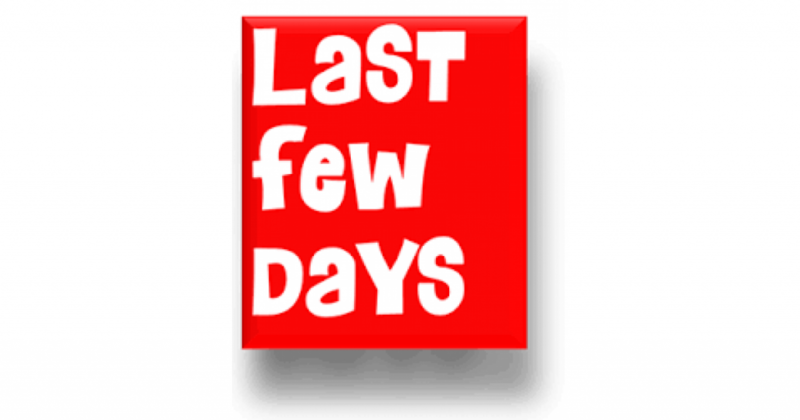 It’s just a Fortnight Left Until your Pro-rated Form 2290 Deadline! Hello there truckers, over this article we are going to discuss about the near term Pro-rated HVUT Form 2290 Deadline which is due by March 31st, 2019 for vehicles first used since February 2019. This deadline is determined on the basis of the Federal law that states that Form 2290 must be filed on a truck by the last day of the month following the month of its first use. Now having said that, this pro-rated HVUT Form 2290 deadline is only applicable for vehicles first used since February 2019 but it has no impact over the regular annual renewal which is generally due by June and its payable until the end of August every year. The Form 2290 is basically the annual taxes been paid to the Internal Revenue Service for Heavy vehicles which comprises a minimum gross weight of 55000 lbs or more and if the same vehicle is used on the Public Highway for commercial purposes. However, taxes are not levied if the vehicles mileage remains to be less than 5000 miles in case of commercial based units and 7500 miles or less in case of Agricultural based units. This entry was posted in 2290 e-file, EIN, Form 2290, Truck Tax Online and tagged federal heavy highway form 2290 irs, file form 2290, form 2290 due, form 2290 heavy highway vehicle tax, form 2290 heavy truck tax, form 2290 heavy use tax, form 2290 instructions, form 2290 online, internal revenue form 2290, IRS form 2290, schedule 1 form 2290 on March 14, 2019 by Truck Dues. 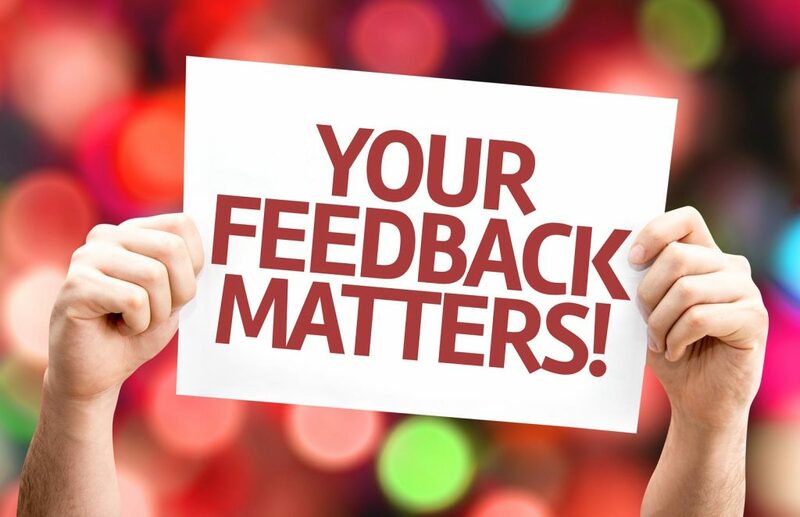 Hello there Truckers, over this article we approach you with a kind request to post your valuable feedback about our services over our partnered online review seeking community Trustpilot.com to enhance our customer satisfaction. This initiative is been introduced with a motive to seek honest reviews from our customers to evaluate our level of service, trust & satisfaction factor among our users, their feedback would honestly help us to identify any areas of improvement to deliver a better customer support experience & user-friendliness of the web application. 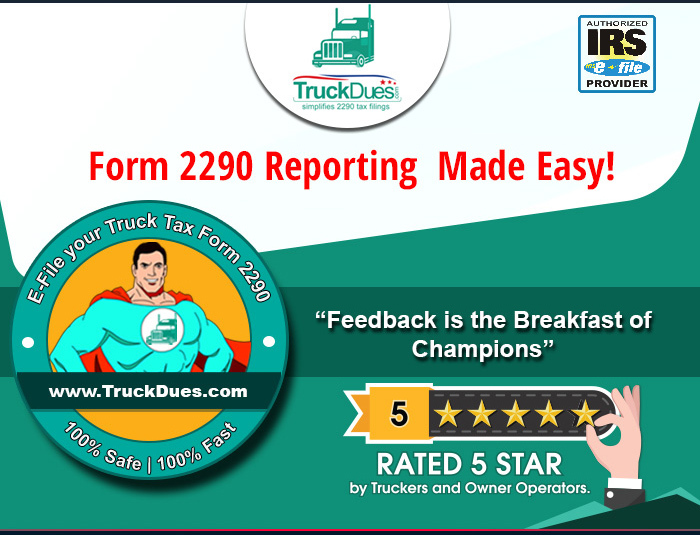 Truckdues.com has been serving the ever hard working trucking community over the past 5 years with their HVUT Form 2290 needs at a much affordable price. We were the first e-file provider to introduce a honest pricing into the industry ($7.99 to report a single vehicle) and our unique feature is that one can correct the incorrectly reported VIN as many times they want to with no additional fee*. We never make exceptions on the customer satisfaction attribute as we make zero tolerance against any reported discrepancies. E-File your Pro-rated HVUT Form 2290 before March 31st, 2019 for vehicles first used since February 2019, as the Federal law indicates that the Form 2290 needs to be filed on a vehicle by the last day of the month following the month of its first use. E-File now to receive the IRS digital watermarked copy of schedule 1 back in your registered e-mail address instantly. This entry was posted in 2290 e-file, EIN, Form 2290, Truck Tax Online and tagged +2290, 2290 form site irsgov, 2290 form us irs gov, dot form 2290, Efile form 2290, Form 2290 due date, form 2290 pay taxes location, form 2290 penalty, form 2290 where to mail, fuel excise tax form 2290, highway usage tax form 2290, internal revenue service form 2290, printable tax return forms 2290, who needs to file form 2290 on March 13, 2019 by Truck Dues. The Pro-rated HVUT Form 2290 is due by March 31, 2019. Hello there truckers, Over this article we are going to discuss about the near –term HVUT Form 2290 deadline for vehicles that are into service since February 2019. The Federal law states that the Form 2290 must be filed by the last day of the month following the month of its first use. 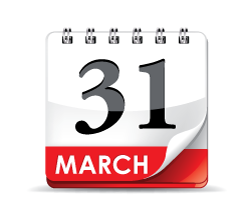 On that basis, March 31, 2019 happens to be the deadline for vehicles first used in February 2019. Taxable vehicle: If your truck would exceed 5000 miles for the Period beginning Feb 1st, 2019 through June 30th, 2019 then your truck is classified to be a Taxable vehicle, for which you are required to make a pro-rated tax due amount to the IRS for the above mentioned period. The tax amount varies among the gross weight of the vehicle. Suspended vehicle: If your truck is expected to be used under 5000 miles for the Period beginning Feb 1st, 2019 through June 30th, 2019, then your truck is classified to be a Suspended vehicle, in other word an Exempt vehicle for which you’re not required to make any tax payment however, you need to report the vehicle over a Form 2290 under Suspended Vehicle to claim an exemption for the reported period. When we talk about the taxable gross weight, it includes the weight of the Tractor+ Trailer+ the maximum Load carried. 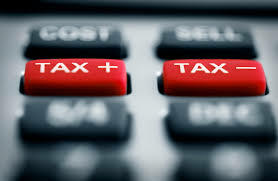 Then enter the maximum carrying weight of the vehicle on our application during your E-Filing process so our inbuilt tax calculator would do the computation part by itself on your behalf. This entry was posted in 2290 e-file, American Trucking, EIN, Form 2290, Form 2290 Claims, Truck Tax Online and tagged Form 2290 Amendment, Form 2290 due date, form 2290 instructions, when is a 2290 form due, [can form 2290 be filed online], [form 2290 appointment], [form 2290 cost], [form 2290 filing], [how to file a form 2290], [i need a 2290 form], [whats a form 2290], [who must file a form 2290] [how to correct a form 2290] on March 8, 2019 by Truck Dues. Besides your Pro-rated Form 2290, Form 1120 is due by this month as Well. 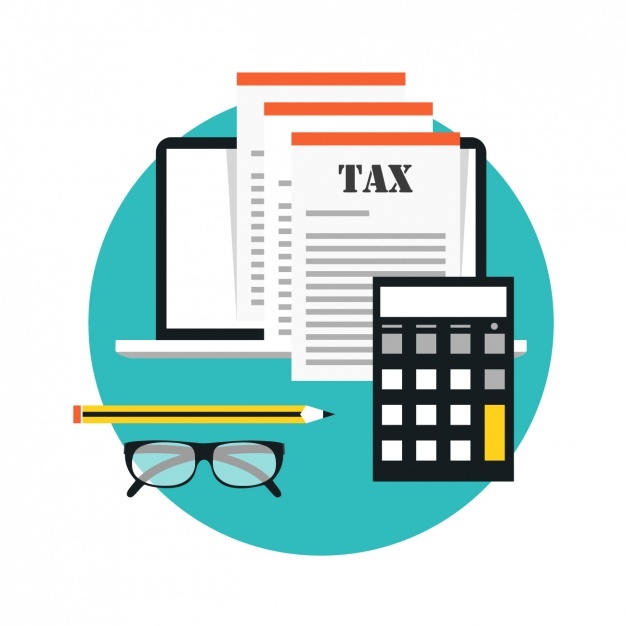 The Form 1120 (officially the “U.S Corporate Income Tax Return”) is one of the IRS tax forms used by corporations (specifically, C corporations) to report their Income, Gains, losses, deductions, credits and to figure out their tax liability. Wondering why we are even discussing about a different tax than Form 2290? Well we would like our Trucking community companies not to miss their business corporation taxes. 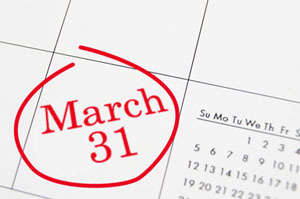 The Tax Form 1120 is generally due by March 15th, every year. However for business that are involved in trucking are working restless to address the nation’s needs on time hence there are greater chances to miss the calculation part near the business tax deadline. So you get a chance to claim an extension via Form 7004, It’s the form used to file for an automatic extension of time to file your business tax return for a partnership, a multiple member LLC filing as a partnership, a corporation, or s-corporation. The IRS indicates that, “Form 7004 does not extend the time for payment of tax.” Hence, you must pay taxes due (guesstimate) by your tax return due date, even if you file an extension application. You may also log on to the official IRS website to find the authorized e-file service provider to have your extensions filed successfully. Now the bloodstream of our nation’s economy (Trucking) taxes HVUT Form 2290 is also due by the end of this month on a Pro-rated basis. By the federal law that states, that Form 2290 must be filed on a vehicle by the last day of the month following the month of its first use. On this basis, the Pro-rated Form 2290 is now due by March 31st, 2019 for vehicles that are into service since February 2019. This entry was posted in 2290 e-file, American Trucking, EIN, Form 2290, IRS updates, Truck Tax Online and tagged Business tax Form, Corporation tax, federal heavy highway form 2290 irs, file form 2290, Form 1120, form 2290 due, form 2290 heavy highway vehicle tax, form 2290 heavy use tax, form 2290 instructions, form 2290 online, internal revenue form 2290, IRS form 2290, schedule 1 form 2290 on March 5, 2019 by Truck Dues.